This juice bar stocks fresh fruit juices, and even healthy, sugar-free ones for weight watchers and diabetics along with decadent milkshakes and some quick bites too. With their origins in the Middle East, this juice bar offers an overwhelming number of drinks to choose from. 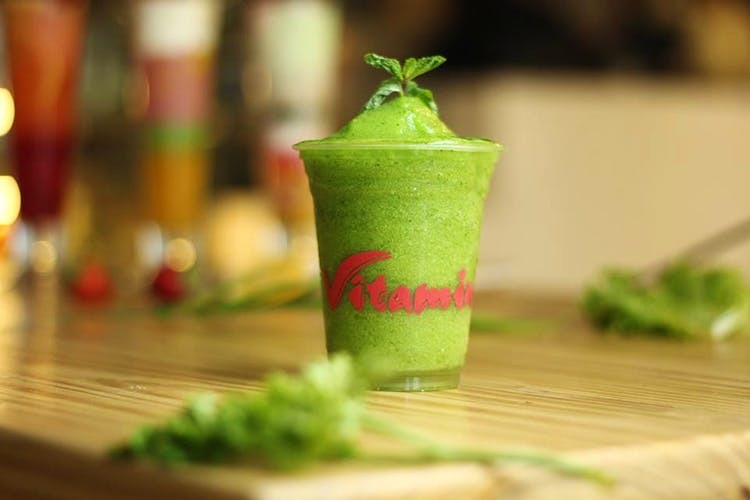 They serve a large selection of juices, milkshakes, Arabian shakes, mocktails, massive faloodas exploding with fruit, unusual flavours of lassi, couple special juices, flavoured coffee, ice tea and an entire section that is devoted to healthy juices and beverages. They have drinks for those who do yoga such as carrot steam juice and a peanut butter drink. For those who love their fruity nutrients, these guys offer juices with generous slices of fruit in them. Diabetic juices such as grapefruit, bitter melon and bitter gourd are also available. Vitamin Palace also does energy drinks like the Iron Maiden and the Vitamin C boost shot juice. There is also food to match with the theme of the place. Take your pick from fresh fruit bowls, shawarma, noodles and pasta, fried chicken, desserts, yummy chocolate fruit fondue and many kinds of ice-cream. The ambience here alone is worth the trip as the decor comprises real fruit artwork displayed around the restaurant. The seating is colourful and everything looks fresh and fruity.